Are you a fun-loving, family-focused couple looking for a Sunshine Coast wedding videographer? I’ll capture what’s important to you in a candid, authentic way. the principal videographer of Your Wedding Story. I adore filming weddings in the Sunshine Coast hinterland areas around Maleny and Montville! And give me a beachside Noosa wedding any day of the week! If you’re the kind of couple who want a candid, authentic telling of your wedding day rather than a cringeworthy Hollywood-style production, I am probably the wedding videographer for you! Coming from a journalism background, I believe your wedding video shouldn’t just be a montage with a soundtrack — it should include audio, and tell a story about the things that are important to you. 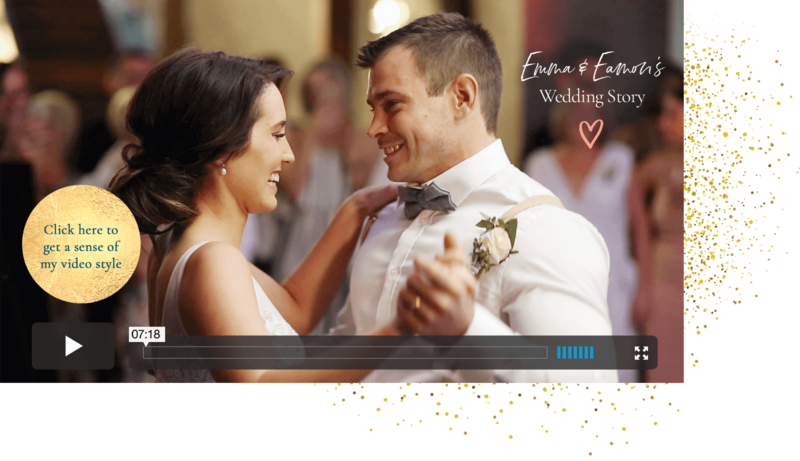 Recognised among Queensland’s top three videographers for two consecutive years with a rating above 99.6% from brides, I am so passionate about not only making an amazing wedding video for you, but also doing everything I can to make your Sunny Coast wedding day run smoothly behind the scenes, so you can just relax and enjoy every moment. My wedding videography style is candid, authentic and a faithful rendition of your day. Nothing cheesy. I love my clients and go above and beyond, so I consistently receive five star reviews. This love story really gets me in the heart. Trudy and Brad have six grown up sons between them, and a couple of grandkids. When your own children are this delighted to see you find love, you know you’re on to something pure, good, and true. Trudy and Brad are the proof that indeed your soul mate can arrive at any time.